The IDF hits 150 targets overnight, taking out dozens of rocket launchers and bringing the total number of targets struck to 500. The IDF hit roughly 150 terrorist targets in Gaza over Thursday night. Most of the targets hit were rocket launchers used for mid-range missiles. IAF planes also took out several weapons storage sites. 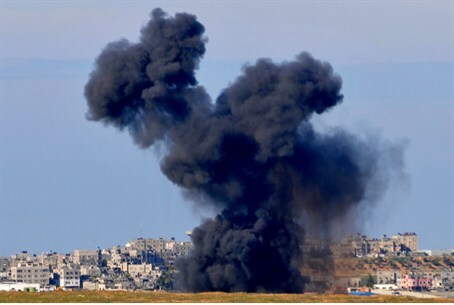 Palestinian Authority media reported that another site targeted Thursday night was the home of senior Hamas commander Mohammad Sanour in Khan Younis. Two people were reportedly injured in the strike. The strikes have so far had the desired effect: a significant reduction in the frequency of rocket attacks on Israel. Terrorists launched several rockets overnight, compared to several dozen per night earlier in the week. Strikes continue, with the IDF taking out underground launch sites. IDF sources said the military has precise intelligence information on the location of the sites. The Hebrew name for the operation is Amud Anan, a reference to the G-d-sent Pillar of Smoke (cloud) that protected the Children of Israel in their desert sojourn during the day, while a pillar of fire lit their way at night. Since the literal translation would not have that association, the English official translation differs from the literal meaning of the expression.